I wrote in the last blog post about the mixed results from my 2015 life goals and decided maybe there were too many and my plan was a little too ambitious. So, this year my goal is to concentrate on trying to improve fewer things! Here they are. Declutter one section of the house every week — and document it by taking “before” and “after pix, like Victoria Huizinga did on her blog, Snail Pace Transformation. It was very inspiring! Do one new thing a week (it doesn’t have to be big). Stay in touch with my family more (mostly by email — and more visits, too). Try online banking (which everyone else did years ago). Try to get an average of 65,000 steps a week on the Fitbit I’ve been using for more than two years. Walked 2,644,033 million steps last year (wow! that’s 1,106 miles), and that averaged 50,847 a week. Only need to get about a million more steps this year (actually, only 735,967 — to be exact). Putting them out here publicly (using your blog to stick to your resolutions: great point, Lauren Regan!) gives you more motivation to accomplish them! 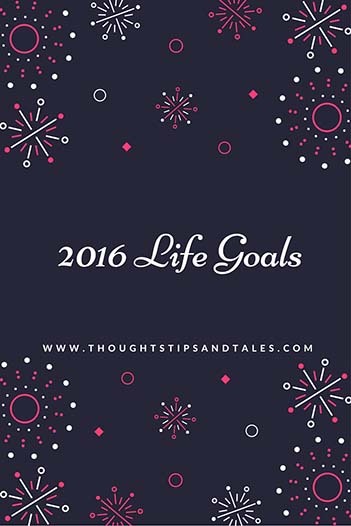 This entry was posted in goals, life goal, resolutions and tagged 2016 goals, 2016 resolutions, life goals, resolutions. Bookmark the permalink. LOVE the stepping goal! And thanks for mentioning my 52 Weeks To A Simplified Home. Glad you saw this. You really did motivate me to do the same thing! Two down, 50 to go. We are loving the fit bits. We are both hitting around 11,000 per day, so we are trying for 12,000. If we don’t hit 84,000 for the week, we have to put $10 in our savings drawer. Bill gets a lot of steps at work, and it’s been a warm enough winter to walk the dog several times a day. Wow, 11,000 a day is great! Love the $10 motivation idea, too.